Das passende Produkt nicht gefunden? 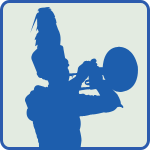 Composed and Arranged for Marching Band by John M. Meehan Easy/Medium Blue Devils Marching Band Arrangement. by Wayne Downey Adapted for Marching Band by John M. Meehan Medium Blue Devils Marching Band Arrangement.